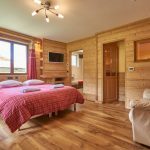 We have a great selection of catered chalets and self catering apartments for groups, families and solo bikers looking for accommodation in the Les Gets / Morzine area. All our chalets and apartments are located within easy walking distance of the main village centre and the lift station. We offer secure bike storage for anyone bringing their own equipment. Most of our Chalets have bike washing facilities and basic tools for simple repairs. Have a look below at the Chalets and Apartments we offer in Les Gets / Morzine and click on the image for more information about the property and how to book. 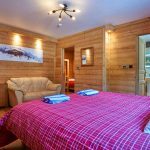 Chalet Aventure is ideally located near the centre of Les Gets and set in its own grounds with secure bike and equipment storage. The enclosed garden area is perfect for BBQ’s and the balcony is a great place to catch the last of the sun with a cold beer or glass of wine in the evening. The centre of Les Gets and the lifts in town are only a five minute stroll from the Chalet – and for Mountain Biking, it is all down hill to the chalet at the end of a hard day out on the mountain!! Chalet Aventure has flexible accommodation to suit your needs. We can accommodate up to 16 guests with the following bedroom options: Single Rooms, Twin Rooms, Double Rooms, Triple Rooms, Quad Rooms, Family Rooms. All bedrooms have ensuite facilities. Apartment Soleil is large enough to sleep 4 guests – perfect for a group of friends or a family. The apartment has a cabin bunk room and a large lounge which can sleep up to four. There is a bathroom and a fully equipped kitchenette. Perfect for anyone looking for self catering accommodation. If you are mountain biking then the main lifts to take you up to the top of the downhill runs and the epic cross country tracks are just a few minutes cycle away. Apartment Perrier is located on the ground floor of Chalet Aventure and enjoys all the same benefits of location and views as the Chalet: mountain views all around, five minutes stroll to the centre of Les Gets and a downhill route back to the chalet door at the end of your day out biking. The apartment has a large private garden outside complete with a BBQ and seating area. There is plenty of room for bike maintenance on the lawn area. The apartment is located in a quiet area of the village.